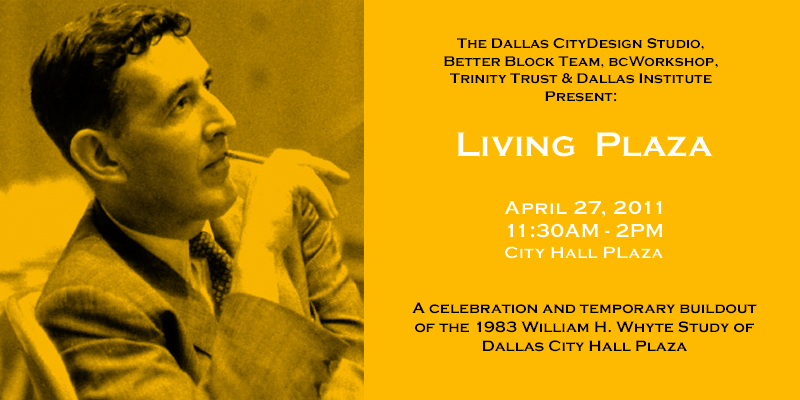 On April 27th, 2011, the CityDesign Studio, the Better Block Team, bcWorkshop, Trinity Trust and the Dallas Institute are kicking off a collaboration to champion the creation of great public spaces in the city. In 1983, renowned sociologist William H. Whyte was asked to study Dallas’ City Hall Plaza and develop a plan to help bring life and energy to the area. Though the conclusions Whyte arrived at were befitting, they occurred at a time when populations were exiting downtowns at a rapid rate and less inclined to champion urbanism. 27 years later, a new energy and excitement can be found in the city…one that heralds bringing life back to once neglected areas and developing great public spaces. Stay tuned for more details to come. The Trinity River Yacht Club will host a mini regatta on the fountain. Many thanks to the club!